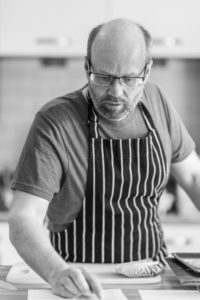 With over 20 years experience in the catering industry, I am well placed to help with menu development, new product development, teaching, mentoring, kitchen design, etc. I’ve achieved a number of accolades to my name over the years including a Michelin star held for five years, 3 AA rosettes held for 8 years and a score of 5 in the Good Food Guide, all awarded during the last twelve years spent running my own restaurant, Sienna, in Dorchester. During this period, my role grew to include various consultancy projects for food producers, suppliers and local government. The aim with all my consultancy roles is to build a long-term relationship that is about helping you to achieve your goals. I’ve also built up an invaluable list of contacts that include regional and national food suppliers, equipment suppliers, wine and beverage specialists, interior designers, web designers and marketing specialists, all of whom can add to the value of the consultancy service. Having owned and run a highly successful restaurant for many years, I can focus on the complete picture, being fully aware from my own experiences the relationship between all sides of a catering business. We can also provide help relating to marketing, PR and social media use both directly and through various specialists in these areas. Click the links here for details of our photography and content creation. 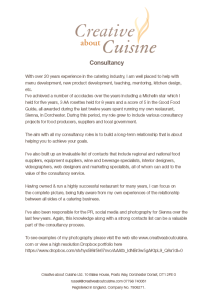 Click the image to the left to see my consultancy White Paper which has a special offer for Dorset Food and Drink Members. Mediteria are speciality Spanish food importers who I’ve worked with for several years, evaluating and testing new products to introduce to their range. Managing Director Scott Wilson was looking to introduce high quality couverture chocolate to Mediteria’s product portfolio. My role was to evaluate samples and then hold a workshop for Scott and some of his staff, comparing the chosen range from Chocovic with other brands in the UK market. I developed sample recipes to demonstrate the complex flavour profiles and performance of the various chocolates within the range.